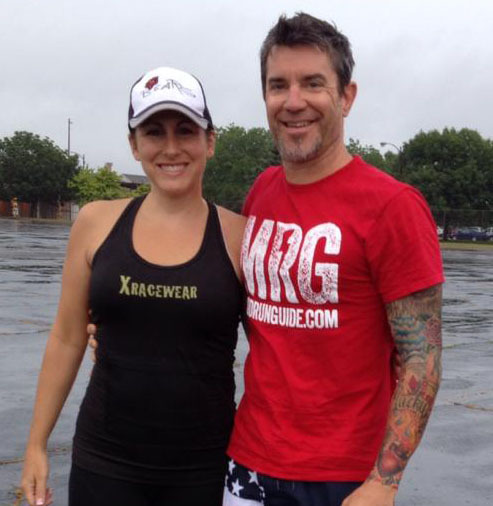 What are the best shoes for obstacle course racing & mud runs? Ask the Icebug Guy! 2017 Update – check out the newest Icebug models! [original article, 7/15] We're halfway through 2015 and even with my poor math skills, that puts us officially 4.5 years into the development of obstacle course racing as a sport, and shoe manufacturers are finally getting OCR-specific shoe models into their lineup. Reebok jumped in with both feet with their Spartan Race partnership, Inov8 has been producing trail shoes for several years and made the easy transition tto the mud run bandwagon. Vibram went all-in on their partnership with Warrior Dash and produce several minimalistic fivefinger off-road versions some folks like to use for mud runs, Salomon has delivered several different models that can be found on the feet of world-class trail runners (and '14 Warrior Dash World Champion, Max King) and scores of obstacle racers worldwide. Under Armour even dabbled with a poorly-received Tough Mudder shoe; as innovative of a company as they are, you can be sure there will be new models coming soon with their new partnerships in OCR. I've personally tested nearly all of the brands mentioned above (nope, never got a pair of the UA/TM ones) and guess what? I'm not here to talk about ANY of them at all. Today, I'm going to run through the top 3 Icebug shoes for OCR – some awesome models I've been lucky enough to test over the past year. Why Icebug? I'm glad you asked. A little about me: For most of the last decade, I've had a really cool gig as a product tester or brand influencer for everything from taste-testing new Clif Bars to test piloting innovative footwear from Newton Running, Spira Footwear, Salomon, and most recently, Icebug Footwear. (PLEASE save the emails, I don't have any advice on how you can get a similar gig, OK?) Ever since we've launched Mud Run Guide in 2012, I've received hundreds of surprises in the mail from different manufacturers – some good, and some really, really bad. Even as I'm writing this, I have 3 different samples on my desk from QALO, Hammer Strength, and BEARD Bars – life is good. 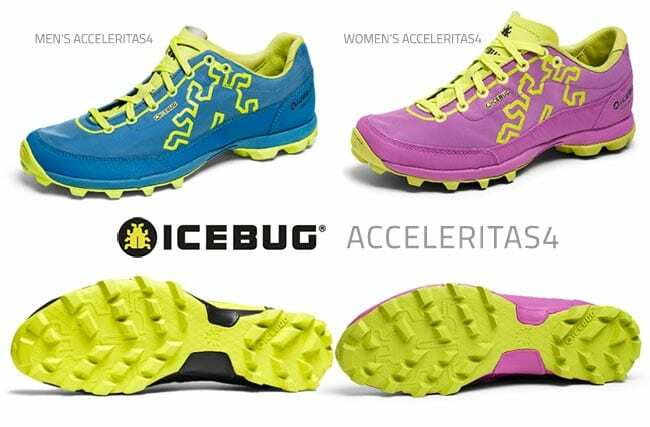 I've known a little about Icebug for a few years, but originally thought they only carried studded shoes. As a guy living in Phoenix, AZ, I have exactly zero need for those, and I was pleasantly surprised when I received (2) pair of testers: Acceleritas & Enlights back in late 2013. First impressions: No studs, sticky rubber soles, and really well-made uppers. I was fresh off of alternating between Salomon Fellraisers and Inov8 BareClaw 200, and the Acceleritas seemed to blend the best of both shoes: Copious amounts of traction in a light, flexible shoe that just enough structure to hold up for 10 or more miles on the trails. The Enlight were a great all-around shoe with good on/off-road traction (Note: the new, upgraded model is the Anema) Maybe I'll cover those models in a light trail/road/lifestyle review of the Icebug shoes, as I'm keen to tell you how awesome the Juniper is for basketball too. Once I fell in love with the Icebug brand, I was lucky enough to get to hang out with the staff, starting with Icebug USA's president, all the way up to doing shots in Utah (see photo below) with the owner of the entire company. From top-to-bottom, I dig these cats and the kicks they produce. 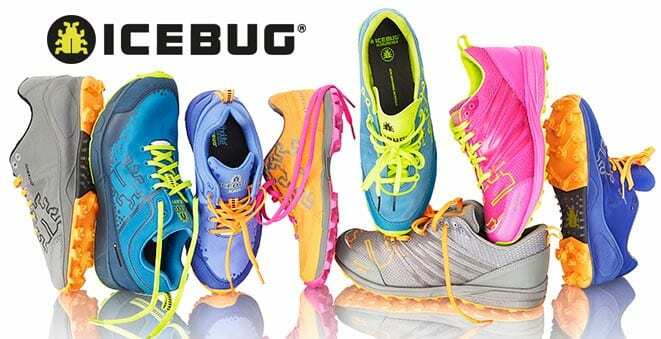 Icebug has grown into the official shoe of OCR Warrior, The OCR World Championships, and are in the process of a deeper partnership with Mud Run Guide. A small brand with a small(ish) budget didn't just buy their way into being the official shoe; they impressed us with the diversity and quality of their product line! Looking for an all-purpose shoe that breathes (and drains) better than any other shoe on the market? 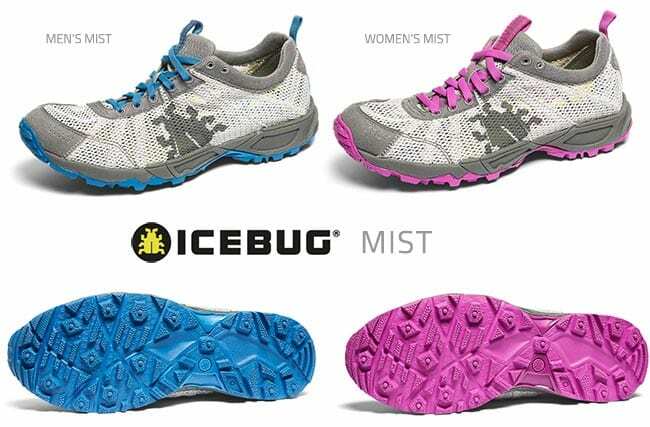 Then look no further than the Women’s Icebug Mist. The open mesh upper creates a perfect foot climate while the moulded TPU lacing extensions ensures a great fit. The midsole is stable and has a low (5mm) drop which is an all-round great combo for a shoe with a wide range of target activities. The RB9X outsole is less aggressive than the Acceleritas, but provides superb traction even on wet surfaces. IDEAL FOR: Obstacle racers and runners who want a super lightweight shoe with maximum traction, yet need a high level of drainage and climate control. I love these shoes for all-around running, both on & off-road training and shorter, wetter OCR's. The traction is pretty darn good, but not quite up to the obscene level of grip that the Zeal or the Accleritas have. The HUGE advantage of these shoes is how light, breathable they are, and of course extreme drainage from the next-to-nothing upper. Well, actually, that's not correct: the upper is pretty wide-open mesh to let air & water in & out, but the upper connects to the eyelets for a little bit more structure than you'd expect when you first pull 'em out of the box. Even with the grippy treads on the bottom, the Mist are perfectly adequate for road running, and the RB9X rubber holds up pretty well when logging road miles, and exceptionally long off-road. Cons: The mesh lets water in & out along with sand and some really small pebbles. When paired with some good poly socks and plenty of water, they will drain out all the silt pretty easily. Perfect Shoes For: Warrior Dash or similar. I choose the Mist for any OCR or trail run that has plenty of water crossings and fewer deep mud pits. In thicker mud I recommend the Acceleritas or will choose the Zeal for longer, more technical runs. Final Word: I wear these shoes every. single. day. Whether just running errands or a 5k to 5 miler on the road & trails, the Mist are my go-to shoes. For pure road running I will rotate the Mist with the Enlight, and use those for a 5k to marathon road race or triathlon. NOTE: These Acceleritas4 OCR LE were produced in very small quantities, as few as 100 pairs in USA and 180 pairs were available in Europe. The new 2015 Men’s Icebug Acceleritas4 RB9X is the ultimate OCR shoe for the serious athlete. A low drop allows for a more natural stride while the narrow last offers improved responsiveness over obstacles and terrain. As an added bonus, the re-worked midsole construction makes it even lighter than before. The Men’s Icebug Acceleritas4 OCR is a limited edition take on the new 2015 Acceleritas4 RB9X. Featuring a more supportive & stable tongue, a more durable outsole and an improved rugged upper, these might be the unicorn of OCR footwear. IDEAL FOR: Serious obstacle racers and runners who want a super lightweight shoe with maximum traction. Brett's Review: Quite possibly the most flexible shoe I've ever worn while simultaneously loaded with big ‘ol lugs that eat up all the mud, dirt, and loose rocks you can find out on the trail or during a mud run. Those gnarly lugs are made up of their RB9X rubber, so they are soft & sticky, but wear exceptionally well to boot. The tread pattern is designed after a tractor tire, the first lugs move the loose stuff and the rest of the lugs dig right in to give you unprecedented grip on nearly all surfaces. Low drop, thin, snug, and light, the Acceleritas4 “disappear” on your feet and let you just concentrate on running with the utmost confidence that your feet aren't slipping anywhere. The flexible sole contours over rocks and obstacles for superb grip, and because they are so minimal you can actually feel the ground – improving your agility & responsiveness. Pros: Light and flexible with insane grip, they are like tight slippers with claws on the bottom. The upper is highly water-resistant, so any water below the ankle stays out, and the upper also sheds mud very quickly as there's nothing for it to stick to! Cons: The upper is great for keeping water out, and once it gets in, can take a few extra steps to eject from around the tongue. The OCR LE does a little better job with perforated tongue, but I have never personally had any issue with water drainage in this shoe, as it is a snug fit with non-absorbing materials – where would the water stay? The fit is listed as “narrow” but I find them to be average, and they also flex a bit for wider feet with a little bit of wear. Personally, I like them very snug on my feet like a second skin. Big knobs on the bottom does not make the Acceleritas4 a road-running shoe. Sure, you can run from the parking lot to the trails & back, but don't go run a 5k on the road in 'em. Perfect Shoes For: Spartan Race, Tough Mudder, BattleFrog, etc. along with just about any trail run, adventure race, or mud run where traction is important. Lace 'em up and they go to work, disappearing on your feet and providing all the grip and flexibility you could possibly want. Final Word: More traction than the Mist for deeper mud or loose rocks & dirt out on the trail, though not road-ready like the Mist. More flexible than the Zeal for all-around off road running and OCR's, lacking in the innovative support and additional traction the Zeal can provide for longer distance or more technical conditions. Extremely durable shoes, I've tested the Acceleritas4 for over a year in trail and mud runs, and the upper and sole are in great shape, ready for even more punishment. True Story: I gave my year-old test Acceleritas4 to a friend who used them through the remainder of '14 and most of '15 season for training and racing (after his Reebok Supers disintegrated, but that's another story) and they still look the same. He's moved up to Zeals for racing, and still uses the Accel4 for training. The video at the bottom of the page shoes just how flexible the Acceleritas4 sole really is! 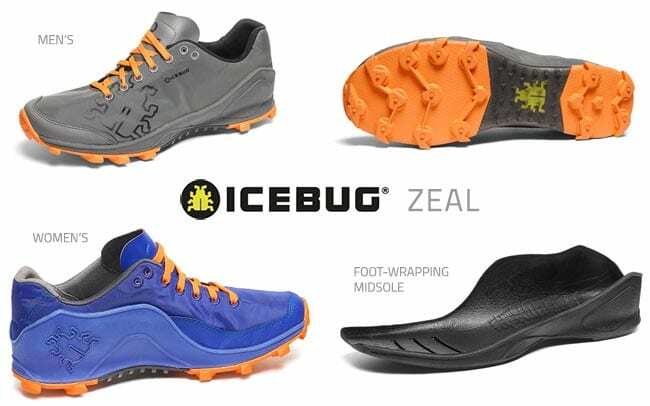 Introducing the Holy Grail of OCR footwear – the new Icebug Zeal RB9X! With a perfect balance of stability, flexibility, and grip, the Zeal RB9X brings true innovation to the obstacle course racing market. The upper material is a light yet durable nylon textile that combines a lacing system that embraces the foot firmly. The midsole construction, which uses Lightweight EVA with HGMS2® technology, allows the Zeal to provide a stable but soft heel grip AND superb fit. The height of the heel cup is also slightly reduced to alleviate pressure at the Achilles tendon, while the medium last is half lined with Quick Dry mesh. Finally, it features an RB9X® outsole (the benchmark among “sticky rubbers”) with outsole cleats and deep lug patterns positioned to shed mud and debris. Pros: Awesome traction, sole protection, and amazing stability while still being lightweight racers due to their radical foot-wrapping midsole. They are badass racing shoes for sure. Cons: Less flexible than the Acceleritas4 for all-around usage, and the stiff midsole is not designed for road running – at all. Once water gets in, it will need to work its way out around the tongue. If the fit is right (i.e. not a lot of space in the toe box) it's a non-issue. If you like to wear them a half-size big, you'll be squishing for a while until it is all pushed out. Perfect Shoes For: Running on technical terrain: ascending or descending steep, rocky, or muddy hills, and over roots, rocks, and most importantly for OCR – obstacles. Final Word: Using technology designed specifically to build the best long-distance off road shoe, the Zeal is a purpose-driven shoe for those who want absolute confidence in the traction of their footwear. The water resistant upper does a fantastic job keeping water out and the slick surface sheds mud almost immediately. Once you get water in at the ankle, it needs to work its way out through the tongue area. While it may seem expensive to have a shoe that's just for trail racing or OCR, these shoes are a weapon that you can pull out when needed. True Story: While I've worn the Zeal for many, steep trail runs on technical & rocky AZ trails and as many OCR's as I can, they have also become my favorite – try not to chuckle – cleats for soccer, softball, and even golfing. Yup; the Zeal's grip goes a long way! Mist for all-around trail running, training (on & off road), summer activities like kayaking, hiking, cliff jumping, or anything where you want traction around water. Heading out to do a Warrior Dash or a short mud run that's heavier on water and not-so-much covered in thick mud? The Mist are exactly what you need. Acceleritas4 are the next step up in your trail-running or obstacle course racing obsession. (Yes, you know it's true) More traction in mud, grip on the trail and obstacles, and the only real downside over the Mist is less breathability, water retention, and you can't really use them on the roads. Doing a Spartan Race Sprint or Super? These are your shoe. Yes, they are fine for longer distances, but that's where the Zeal's extra stability really shines. Zeal is engineered for running on technical terrain or racing. Don't run on the road, don't waste your time on a groomed path – these are made for serious conditions, to be worn by semi-serious (and addicted) racers. Can you do almost all the same conditions in Acceleritas'? Well, probably. The addition of the stiff, plastic-studded midsole and foot-wrapping midsole make it much more stable for longer, more technical conditions. Wear these for a Spartan Race Beast & above, BattleFrog BFX, World's Toughest Mudder, or any race that will have you on trails and obstacles for many hours, that's where the foot-wrapping midsole's extra support really makes a difference. Can you wear them for any distance? Of course – just make sure it's not all on the road! This article originally dropped in 2015, Icebug product lineup & pricing may have changed, please refer to Icebug USA's web shop for current pricing. Won’t do my any good until all these companies making OCR shoes come out with a 14 2E or 4E for me to use…until then it will be mostly New Balance for me since they make the size shoe I need.